If you’re in the market for new rose bushes you’ll have noticed that they come in two variations — potted up, or as bare root plants. Rose bushes that arrive in pots with soil around their roots are very easy to plant and it can be done all the year round. 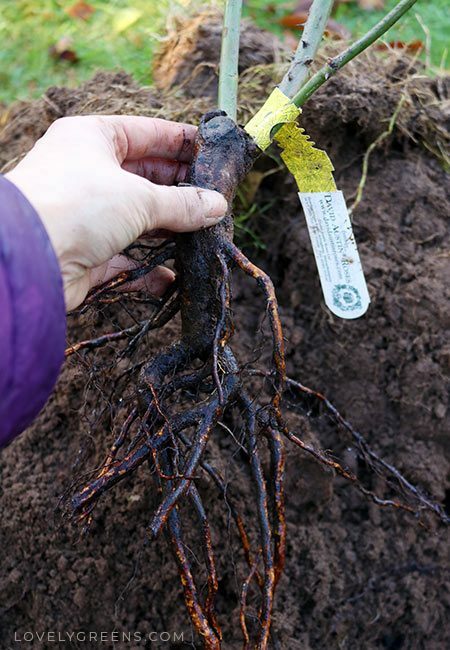 Bare root plants are different and will arrive in plastic bags without any soil at all. 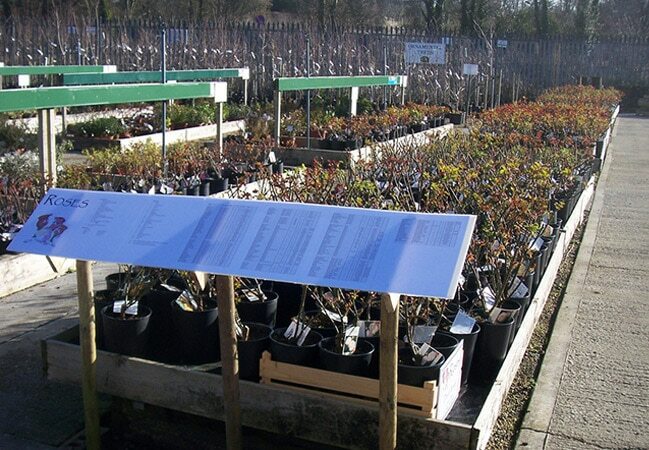 You can only get this variety delivered in the autumn and winter while the plant is dormant. This is typically the time to plant bare root roses as well. A few months ago we moved into a new house with a small lawned area to the rear. It has a few fruit trees and a greenhouse but the plan is to fully develop it into a vegetable garden — you can see its progress on YouTube. 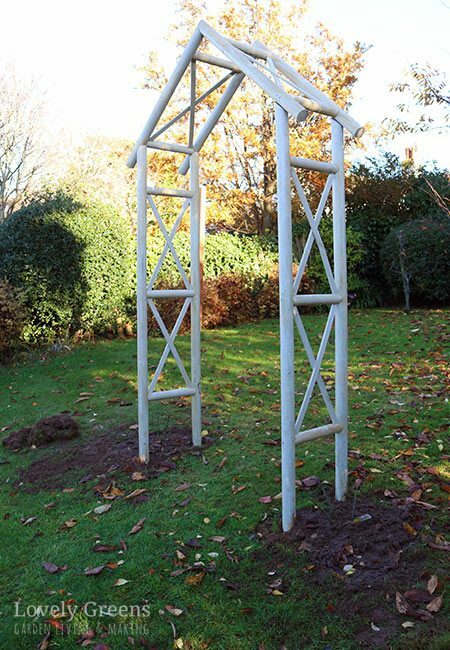 My first addition is a pretty garden arch and on either side I’ve just planted bare root roses. The photos and the video at the end of this piece show how I’ve done it but also include tips on things you may do differently in other climates. If you order bare root roses from a reputable seller they’ll send you the plants at the best time to plant them. It will vary based on where you are in the world but whether it’s November or April, you should get them in the ground asap. In places with mild climates you’ll get your bare root roses in November onward. If you have cold, freezing winters then expect your roses to arrive when it begins to thaw. 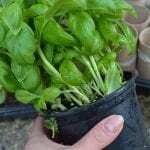 Your plants will arrive in a plastic bag that’s inside another sturdy paper bag or even a box. The roots should be moist and there will likely be no leaves at all on the stems. You should plan on getting them in the ground within a day or two. Store them outside and sprinkle some water over the roots if they look a little dry. If you have mild winters, like we do here on the Isle of Man, you can plant bare root roses all winter long. Once they’re in the ground, the roots are protected from the worst of the cold. They’ll also slowly begin forming bonds with the soil and growing little tendrils of roots. This will help them spring into life when warmer days arrive. In colder climates you’ll want to wait on planting outside, which is why growers will send your plants later. Imagine, they’ve just been pulled up, prepared for shipment in a dark bag, have likely been in a variety of temperatures, and might even be drying out a bit already. They’re probably not going to respond well to being plopped into frozen soil. You have two options in case you can’t plant them immediately. Heel them in or plant them in containers. If the soil isn’t frozen or soaking wet, dig the plants in to a temporary location — otherwise known as heeling them in. 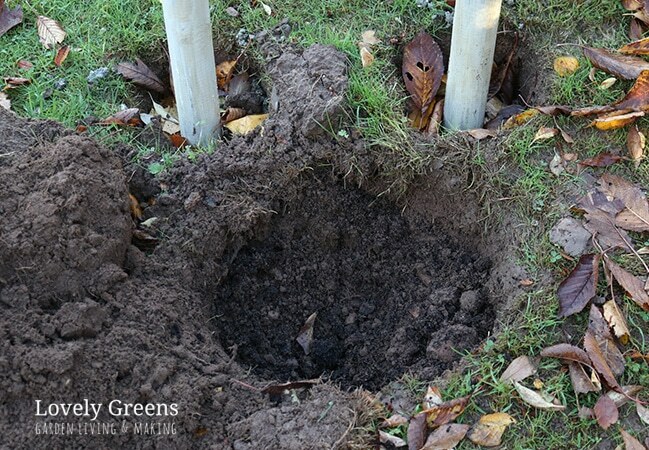 Dig a trench and put your plants in, covering the roots and up to 2/3 of the plant with soil. The plants can be placed in the trench at an angle by as much as 45 degrees. Water well and then mulch with a couple inches of compost, leaves, straw, wood chips, or another material. You don’t need to space them out or plant them upright since this is only a temporary solution. Pull the plants up to plant in their permanent positions before they begin growing again. You can also plant your bare root roses in containers when they arrive. If you do this, you can leave them in the pots until whenever you find time to plant them out. You could even leave them in until the following summer if you’d like. The best place to overwinter container planted roses is in a greenhouse, poly tunnel or against the side of the house. It’s a bit warmer there. You can keep them outside too but make sure that the hardiness rating of the rose is two levels higher than the one you live in. 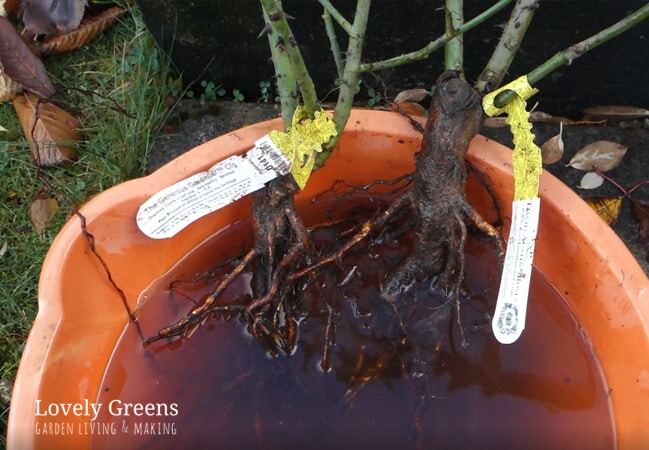 Rose roots will get colder in pots than when planted in the ground. Try to get your roses in containers planted out before they become too big. Not all roses are suitable for permanent planting in pots but there are plenty that are, if that’s what you’re after. My own bare root roses, a type called the Generous Gardener, arrived early November. They’re a type perfect for the edible gardener since they produce big juicy hips and also attract bees and other pollinators. I’ve planted one on either side of a new garden arch that I’ve situated in the centre of my garden. The hope is that these English climbing roses will cover the feature and repeat blossom all summer long. Not only will their fragrant flowers attract bees but I plan on using the petals to make rose petal wine and rose water skin toner. Fill a bucket with water and soak the roots of the rose for about 30 minutes. You do this to re-hydrate the plant and to make sure it won’t suffer for lack of water when you plant it in the ground. Some online sources will say for you to soak for much longer, up to two days even. I imagine that’s only necessary in dry climates or if the roots are very dry though. I’d probably err on just 30 minutes in most cases. You’ll see in the video at the end that I only soaked my plants for about 15 minutes. That’s because there was a lot of moisture in the bag on planting out day. I’d set it outside for a couple of days and during that time quite a lot of rain got inside. 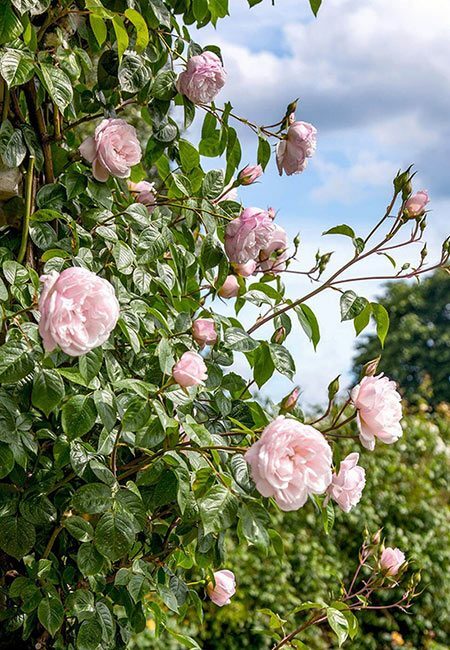 Situate your rose plants in an area that gets good sunshine, isn’t in a windy or exposed area, and isn’t going to be competing with other plants. There should be about 2 feet (60cm) between each rose plant and the next plant. 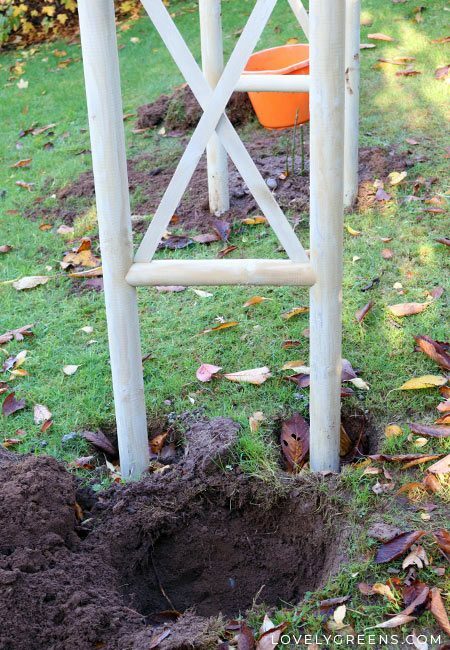 Using your spade, dig a hole 2 feet (60cm) deep and 15″ (40cm) in diameter. 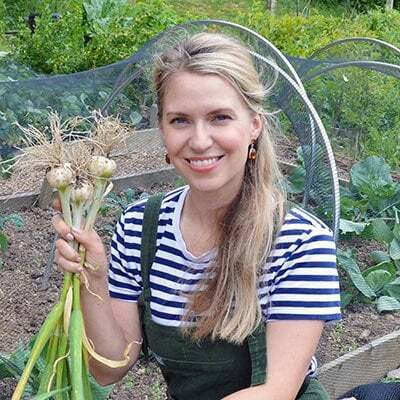 Loosen the bottom of the hole with your garden fork and pile in a good dollop of composted manure. I imagine you could use garden compost too, but manure is very rich in nutrients and might be best. Mix the manure with the soil inside the hole a bit. In recent years it’s been discovered that plants have a complex relationship with the soil. Much of it centres around fungi that form symbiotic relationships with plant roots. It’s estimated that at least 90% of plants depend on mycorrhizae to survive. Mycorrhizae, also known as mycorrhizal fungi, virtually extend the plants roots. This fungi helps feed the plant with both nutrients and water from an area much larger than the actual plant roots grow. 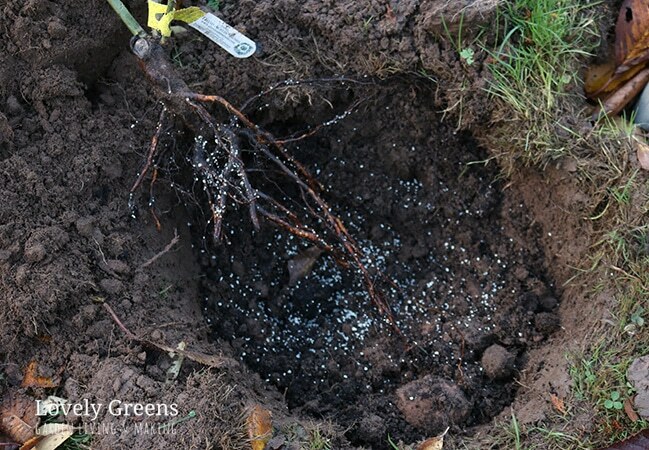 When planting perennials like roses, it helps to introduce the roots to mycorrhizal Fungi manually. It comes in a pelleted form and you sprinkle it on both the roots and inside the planting hole. Actually, if you sprinkle it just on the roots while the plant is held over the hole, you can get two birds with one stone. On grafted roses you’ll find a bud union between the green stems and the roots. The recommendation from David Austin is to plant it 1-2 inches under the soil. However, I’ve found that others recommend leaving this just above soil level in warmer climates. After reading this piece I think it’s clear to listen to David Austin. Planting the bud union just under the soil, in any climate, will help the plant survive wind rock. If the bud union is out of the ground, then not only do the stems whip around but so do the roots. This can cause lasting damage to the plant. Give the plant a good water after filling the hole back in with soil and firming down. Direct the water in a circle around the plant rather than on the plant itself. Cover the area of the hole that was dug with mulch to keep weeds down. Generally speaking, no further care is required until after the rose begins growing again in spring. 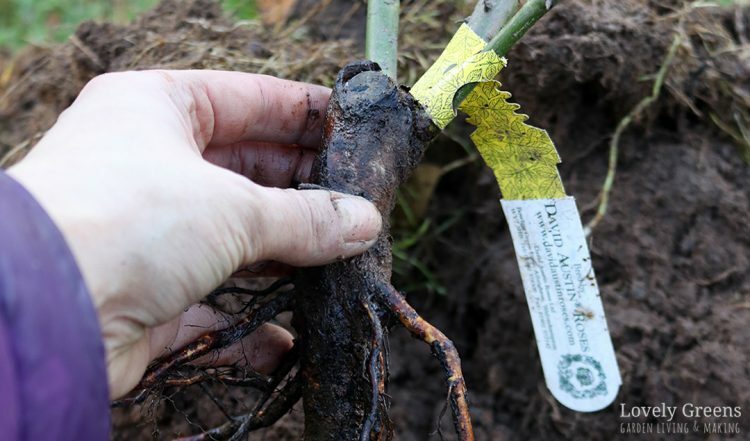 If you’re planting your bare root rose in spring, keep an eye out for dry weather. Water newly planted roses every two to three days during these spells. 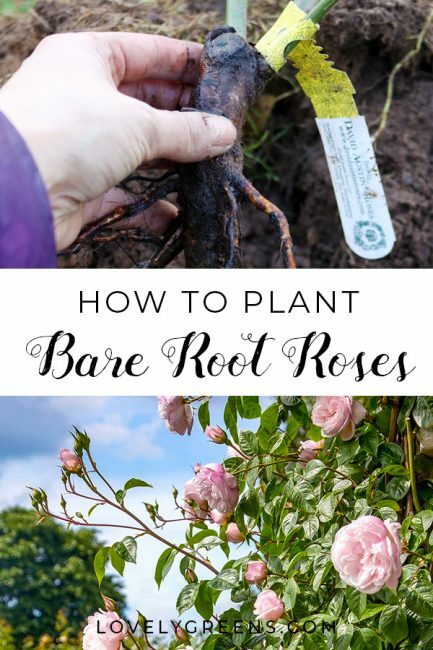 Watch the video below to see the full process of planting bare root roses. For more rose ideas and tips head over here. I would like to know when to fertilize bare root roses and exactly what you use for fertilizer. I’ve read only to use liquid fertilizer for newbies, but what kind is best? Should I use miracle grow that’s formulated for roses, and if so, should it be diluted? Should I also use fish fertilizer, and if so, how often? As an organic gardener I avoid using products like Miracle Grow. 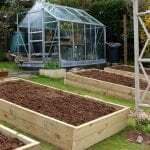 A top dressing of manure or compost in the spring and autumn seems to be enough of a feed for mine. If you do want to fertilize using products, the advice is to wait until the plants are 3-4 years old.